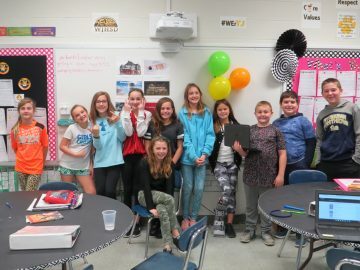 Jefferson Hills Intermediate School fifth-graders in Mrs. Arndt’s Small Group Reading Instruction recently completed “If-Then” stories to share with classmates, applying Google Suite skills along with their storytelling abilities. Students worked in teams using Google Slides to develop stories with multiple scenarios that provide a reader with choices in how they interacted with the stories. Readers are able to choose their own adventure by clicking on different links located at the bottom of the story slides. Mrs. Arndt partnered with Google and Donor’s Choose to implement the project with her students and may earn $300 for the classroom for completing the project with Google Suite. On Monday, Nov. 19, students took part in a publishing party in which they had the opportunity to read and interact with each group’s stories. Students also had to provide feedback via Google Docs sharing one positive comment for each story.